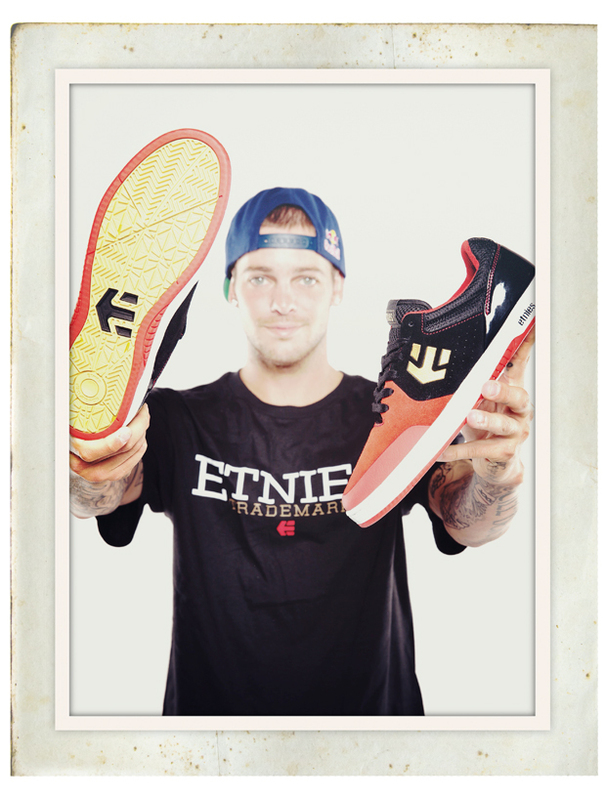 Ryan Sheckler Interview – Sidewalk Mag Product Guide 2013 | F.G.
‘The Marana’ is your seventh shoe with etnies and the one that seems most specifically catered to your style of skateboarding. How has the design process changed over the years? The process has gotten a lot better for sure. The technology behind the shoes make then stronger and last longer. The process has been amazing: I get to work hands-on to produce shoes that I want to skate in. It’s awesome. Sole Tech is completely skater owned, what advantage does this give you when working on a product? It gives me the advantage of knowing that the product we create is going to be for skateboarding. Not just to look good or to chase after on-the-shelf appeal, they’re actually designed to be skated in, shredded in hard. Going pro as young as you did, were you always conscious of how you wanted your products to turn out? I think the older I became the more I realised what I actually wanted and what kind of skateboarding I really do, if that makes sense. So over the years I’ve definitely graduated to a more high quality, higher impact, tougher shoe to fit where I am with my skate style. When it was first released The Marana was completely different to the other shoes in etnies line, can you talk us through some of the performance and design features of the shoe please? Basically I wanted a shoe that had a mid-sole that you could jump in and that would last for the kids out there buying it, so that the parents who were paying for them would be psyched on the shoes too. Also just to have a really comfortable feel – it’s a light shoe and it’s good for every type of skateboarding. So that’s basically the thinking behind it and because of that it definitely looked a lot different from everything else in the line. What do you think to the response to your shoe? I think it’s been amazing man, I see all the kids at the park wearing them and people seem to be stoked on it. I think this is because it genuinely lasts so long. Kids love that; I know I did when I was that age. The shoe has a big focus on durability, do you think its good for professional skateboarders to create something that not only works for themselves, but that the everyday skateboarder can really get their money’s worth from? I absolutely agree with that. That’s why we focussed on making the shoe last so that you can get that broken-in shoe feeling because kids could skate it for so long. All skaters are the same on that I think, where you feel so comfortable in your shoes that you know when you put them on that you’re going to be landing tricks. That’s exactly what we wanted to do with the Marana. Vulcanised models have dominated the shoe market for the last few years. However cup soles seem to making a comeback, why do think this is? Another recurring trend is the running shoe silhouette; could you see yourself releasing a shoe in that style? Yeah I can understand that, after skating all day you definitely want to put on a shoe that feels like a cloud you know? I think everyone feels that after a day of jumping down stuff so yeah, I can see me being interested in releasing a runner-style shoe at some point. As for cupsoles, I’ve always liked them, but I like vulcs too. There’s something to be said for both styles. Finally, how is filming going for the very highly anticipated Plan B video? It’s going. The crew’s back on it, we’re filming. Tags: Etnies, Plan B, Ryan Sheckler, Sidewalk Magazine, Sidewalk Product Guide 2013, skateboarding. Bookmark the permalink.